Robert Nixon took refuge in his car to warm up outside his apartment while crews worked to restore power at the Norton Housing Authority on Thursday. NORTON — It started with a loud bang. Eighty-year-old Malvina Coccia woke up Friday afternoon to the sound of a tree crashing to the ground outside her apartment in Norton. The next thing she knew, wires gave way, a large flame shot into the air, and the electricity went out. “I just looked up and said, ‘How I wish I was in heaven with my family,” Coccia said Thursday. And that outage, which cut power to her apartment in the Norton Housing Authority complex Friday, was just the beginning of a weeklong ordeal. 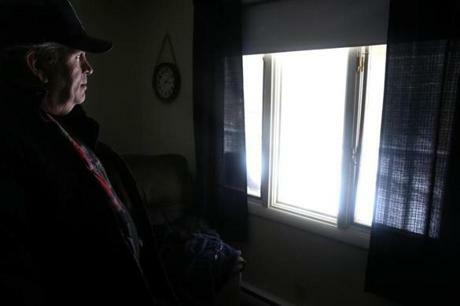 Back-to-back nor’easters made the housing authority lose power twice, leaving the elderly and disabled residents who live there without electricity for several days. 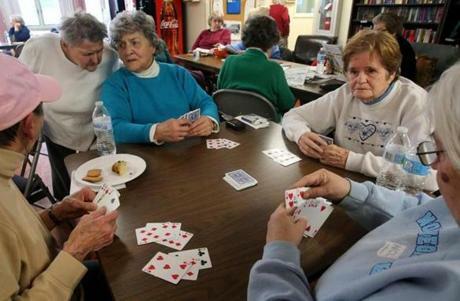 Residents (left to right) Diane Bodington, Jeanne Fredette, Delores Stewart, Sugar Dykeman and Carol Meier gathered over a game of cards in the community center while waiting for power to be restored at the Norton Housing Authority in Norton. The first outage lasted until Monday, housing authority residents said. Then as the second storm struck on Wednesday, residents said the lights went out again at about 3:30 a.m. Thursday. The latest outage occurred when a sub-transmission pole broke, cutting power to nearly the entire town, said Bob Kievra, a spokesman for National Grid, which serves Norton. By midday, the utility had restored power to most of the town, but the housing authority and the high school remained in the dark, according to Norton Fire Chief Paul Schleicher. Crews from National Grid and a tree-cutting service were working on the grounds Thursday afternoon as residents gathered in a community hall that had power — and heat — thanks to a generator. Some said the experience has been harrowing. State officials blamed this round of outages on trees and limbs that were damaged by heavy, wet snow and strong, gusty winds during the nor’easter that began Wednesday and lingered into Thursday. As of 10 p.m., a total of 233,118 customers were without power in Massachusetts, according to utilities. It is expected to be several days before all the lights go back on, state officials said. 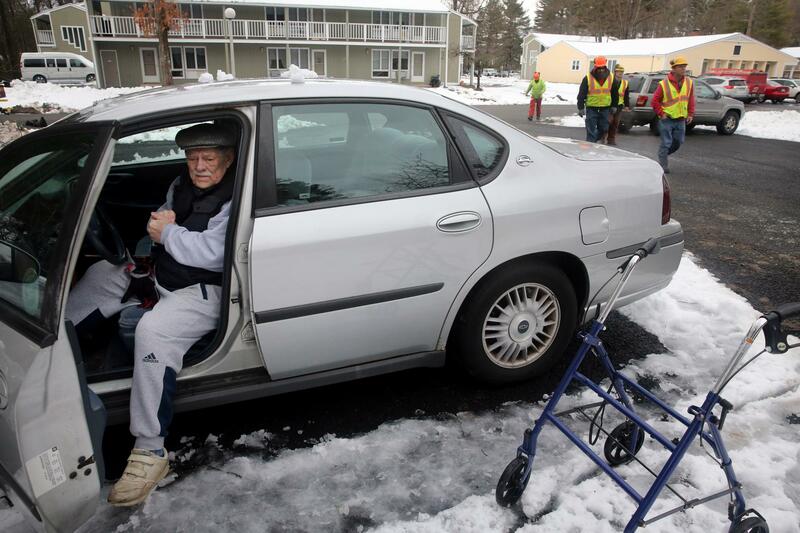 Robert Nixon, 83, who has lived at the Norton Housing Authority for nearly 11 years, went to his car Thursday afternoon to warm up. With his walker sitting near his silver Chevrolet Impala, Nixon cleared snow from the vehicle, turned on the engine, and sat in the driver’s seat. 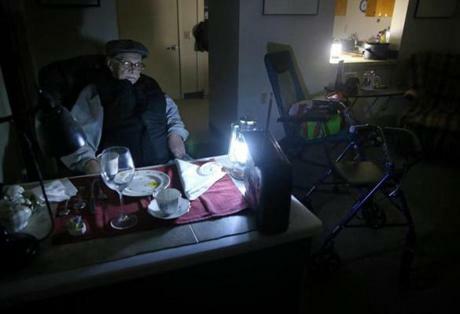 Robert Nixon used a couple battery operated lanterns to light his apartment in Norton. Nixon said he was preparing a beef stew in a crockpot when the electricity went out Friday afternoon. With no power in his apartment all weekend, Nixon said, he had to throw out his groceries. Roche Bros. delivered another order of groceries to him on Thursday, but he had just lost power again. Nixon’s neighbor, Al Marshall, said he and another resident stayed in a Milford hotel for three nights during the first power outage. When he woke up Thursday morning and realized the power had gone out again, Marshall said he reported to work an hour early because electricity was still on at his job. Many residents spent long hours in the community hall, where they prepared food in the kitchen, played cards, watched television, and read newspapers. Al Marshall stood in his apartment while crews worked to restore power at the Norton Housing Authority. But getting there was difficult for some. Coccia, who has lived in the complex for 24 years, said she fell and hit her head as a nurse escorted her to the building Thursday morning. An ambulance took her to Sturdy Memorial Hospital in Attleboro, where Coccia said she underwent a CAT scan before being cleared to return home. During the first outage, some residents slept in the hall because their apartments didn’t have heat. “Some of us stayed up all night. Some of us dozed,” said Michael Young, who spent one night there, sleeping in his wheelchair. Marion May, a retired waitress who has lived in the complex for five years, said the ordeal brought the residents together — even if the circumstances were tough. When the power went out Thursday morning, she said she went to the community hall to make coffee and blueberry pancakes for her neighbors.